Preferred Family Healthcare provides a wide array of treatment employment services in Kansas for substance use Disorder, as well as other behavioral health and prevention services. 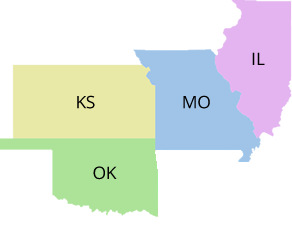 While our current physical locations can be found in Wichita, Olathe, and Winfield, we do provide services in many locations and settings in Kansas. Learn More.. Since 2009 PFH has provided quality behavioral health services including substance use disorder treatment, mental health counseling, anger management, and prevention services to individuals across Kansas. Our programming is designed to meet our consumer's behavioral health needs, utilizing evidence-based practices (EBP), with an emphasis on the delivery of culturally competent services and treatment for individuals suffering from trauma and co-occurring disorders. The versatility in our programming demonstrates that we are dedicated to developing effective, innovative prevention and treatment programs to assist consumers and their families in overcoming barriers such as substance use, while also engaging them in opportunities for individual and family development and providing them with access to needed support services. Our treatment services include a full array of substance use disorder treatment from assessment to outpatient care to residential services. Our Winfield location provides assessment, outpatient, intensive outpatient, social detox, reintegration, and intermediate treatment services in addition to mental health counseling. Our Wichita location provides assessment, outpatient, and intensive outpatient treatment. Additionally, we provide Batterer Intervention Programming, Anger Management and mental health counseling. Our Wichita staff are also co-located with community corrections in Hutchinson, providing services to Reno County. In Olathe we provide assessment, outpatient, and intensive outpatient treatment, in addition to mental health counseling.